A highway overpass is the last place most of us would think to install a farm. But algae, that wonderful little ecological miracle, is different. Since it consumes sunlight and CO2 and spits out oxygen, places with high emissions are actually the perfect growing area. Which is why this overpass in Switzerland has its own algae farm. Built this summer as part of a festival in Genève, the farm is actually fairly simple: It thrives on the emissions of cars that pass below it, augmented by sunlight. A series of pumps and filters regulate the system, and over time, the algae matures into what can be turned into any number of usable products. According to the designers behind it, the Dutch and French design firm Cloud Collective, those uses can range from combustable biomass to material for use in cosmetics and other consumer-facing products. Of course, this is just a proof of concept—an installation to explain how easy it would be to do this on a larger scale. But that's just as important, at this point. Injecting an emerging system like algae into the public consciousness, bit by bit, shows how realistic a larger scale version could really be. [Cloud Collective; DesignBoom]. 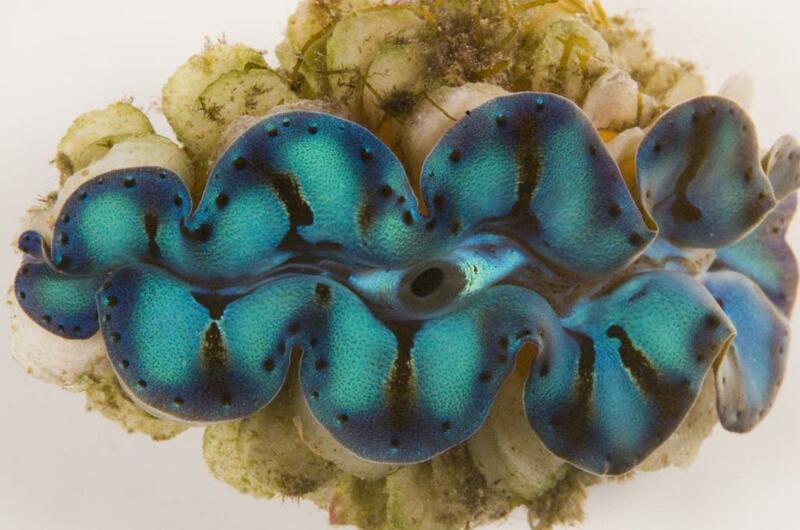 Research from Penn and UCSB shows how giant clams harness the sun - October 2, 2014 - 3:00pm: The research team members began their study hypothesizing that the clams' iridocytes were being used to maximize the usefulness of the light that reaches the algae within their bodies. They were first confounded by the relationship between these iridescent structures and the single-celled plants, until they realized that they had an incomplete picture of their geometry. When they made more precise cross sections of the clams, they found that the algae were organized into pillars, with a layer of iridocytes at the top. "When we saw the complete picture, we understood that the pillars are oriented exactly the wrong way if you want to catch sunlight," Sweeney said. "That's where the iridocytes come into play." The team relied on Amanda Holt and Sanaz Vahidinia to model exactly what was happening to the light once it passed through the iridocytes; the degree of disorder within these cells bore a resemblance to structures Vahidinia studies at NASA: the dust of Saturn's rings. Their analysis suggested that the iridocytes would scatter many wavelengths of light in a cone-like distribution pointing deeper into the clam. Red and blue wavelengths, the most useful to the algae, spread the widest, impacting the sides of the pillars in which the single-celled plants were stacked. Here, we see the structure of the algal pillars (brown) within the clams. Sunlight at the equator is too intense for their algae to be efficient; these pillars are arranged vertically, so the algae do not receive the full brunt of that intensity. 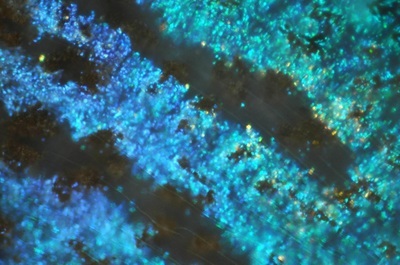 A layer of iridocytes (blue) on top of the pillars scatter many wavelengths of light in a cone-like distribution pointing deeper into the clam. Red and blue wavelengths, the most useful to the algae, spread the widest, impacting the sides of the pillars in which the single-celled plants are stacked. These structures known as iridocytes (in detail on right), give the clams their spectacular color. To test this model, the team constructed fiber optic probes with spherical tips the size of an individual alga. Threaded through a section of clam flesh alongside the native algae, this spherical probe was able to detect the angled light scattered by the iridocytes, whereas a flat-tipped probe, only able to sense light shining straight down, detected nothing. "We see that, at any vertical position within the clam tissue, the light comes in at just about the highest rate at which these algae can make use of photons most efficiently," Sweeney said. "The entire system is scaled so the algae absorb light exactly at the rate where they are happiest." "This provides a gentle, uniform illumination to the vertical pillars consisting of the millions of symbiotic algae that provide nutrients to their animal host by photosynthesis," said Morse. "The combined effect of the deeper penetration of sunlight — reaching more algae that grow densely in the 3-dimensional volume of tissue — and the "step-down" reduction in light intensity — preventing the inhibition of photosynthesis from excessive irradiation -- enables the host to support a much larger population of active algae producing food than possible without the reflective cells." Mimicking the micron-scale structures within the clam's iridocytes and algal pillars could lead to new approaches for boosting the efficiency of photovoltaic cells without having to precisely engineer structures on the nanoscale. Other alternative energy strategies might adopt lessons from the clams in a more direct way: current bioreactors are inefficient because they must constantly stir the algae to keep them exposed to light as they grow and take up more and more space. Adopting the geometry of the iridocytes and algal pillars within the clams would be a way of circumventing that issue. "The clam has to make every square inch count when it comes to efficiency," Sweeney said. "Likewise, all of our alternatives are very expensive when it comes to surface area, so it makes sense to try to solve that problem the way evolution has." Energy Department Announces Up to $25 Million to Reduce Costs of Algal Biofuels - September 30, 2014 - 10:15 am: In support of President Obama’s all-of-the-above energy strategy, the Energy Department today announced up to $25 million in funding to reduce the cost of algal biofuels to less than $5 per gasoline gallon equivalent (gge) by 2019. This funding supports the development of a bioeconomy that can help create green jobs, spur innovation, improve the environment, and achieve national energy security. The funding announced today will support projects in two topic areas: Topic Area 1 awards (anticipated at 1–3 selections) will range from $5–10 million and focus on the development of algae cultures that, in addition to biofuels, produce valuable bioproducts that increase the overall value of the biomass. Topic Area 2 awards (anticipated at 3–7 selections) will range from $0.5–1 million and will focus on the development of crop protection or carbon dioxide utilization technologies to boost biomass productivity in ways that lead to higher yields of algae. Learn more about this funding opportunity here. 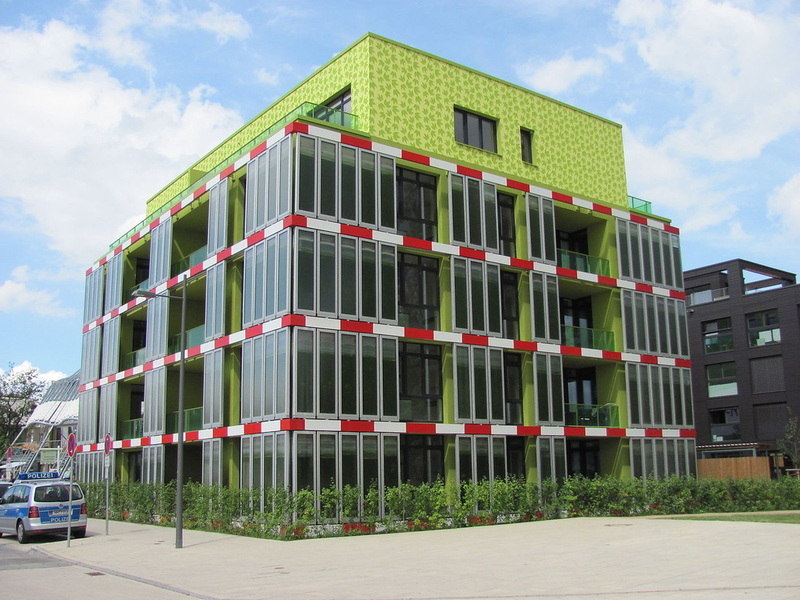 ﻿﻿Algae-powered Building designed and tested in Hamburg, Germany - 23rd September, 2014: ﻿﻿﻿Last spring, Arup, the design and engineering firm that brought the world the Centre Pompidou and the Sydney Opera House, unveiled their latest hypermodern architectural creation in Hamburg. From the outside, the surface of the 15-unit apartment building just looks like a bubbling green lava lamp stretched over an entire building. But those moving bubbles serve a function: they help to feed and order the living algae embedded within the Bio Intelligent Quotient (BIQ) building’s exterior skin. In turn, the 8-foot by 2-foot glass panels of green scuzz—the building’s $6.58 million bioreactor façade—power the entire structure, making it the world’s first algae-powered and theoretically fully self-sufficient building ever. 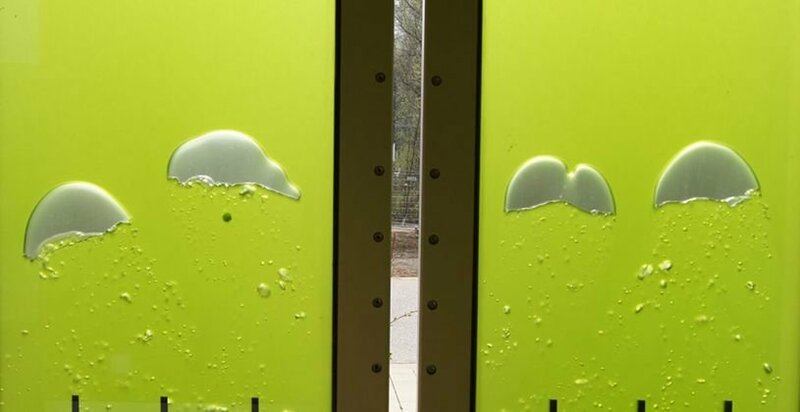 Air bubbles in photobioreactor facades of the BIQ building. Photo courtesy of IBA Hamburg. Rice is one of the crops that could increase their yields by converting solar energy more efficiently. It is difficult to find fault with a process that can create food from sunlight, water and air, but for many plants, there is room for improvement. Researchers have taken an important step towards enhancing photosynthesis by engineering plants with enzymes from blue-green algae that speed up the process of converting carbon dioxide into sugars. The results, published today in Nature, surmount a daunting hurdle on the path to boosting plant yields — a goal that is taking on increasing importance as the world’s population grows. “With the limited ability to increase land use for agriculture, there’s a huge interest in trying to improve yield across all the major crops,” says Steven Gutteridge, a research fellow at chemical firm DuPont’s crop-protection division in Newark, Delaware. Researchers have long wanted to increase yields by targeting Rubisco, the enzyme responsible for converting carbon dioxide into sugar. Rubisco is possibly the most abundant protein on Earth, and can account for up to half of all the soluble protein found in a leaf. But one reason for its abundance is its inefficiency: plants produce so much Rubisco in part to compensate for its slow catalysis. Some have estimated that tinkering with Rubisco and ways to boost the concentration of carbon dioxide around it could generate up to a 60% increase2 in the yields of crops such as rice and wheat. Light speed	Plant geneticist Maureen Hanson of Cornell University in Ithaca, New York, and her colleagues decided to borrow a faster Rubisco from the cyanobacterium Synechococcus elongatus. A team including Hanson and plant physiologist Martin Parry of Rothamsted Research in Harpenden, UK, shuttled bacterial Rubisco genes into the genome of the chloroplast — the cellular organelle where photosynthesis takes place — in the tobacco plant (Nicotiana tabacum), a common model organism for genetic-engineering research. In some of the plants the researchers also added a bacterial protein that is thought to help Rubisco to fold properly. 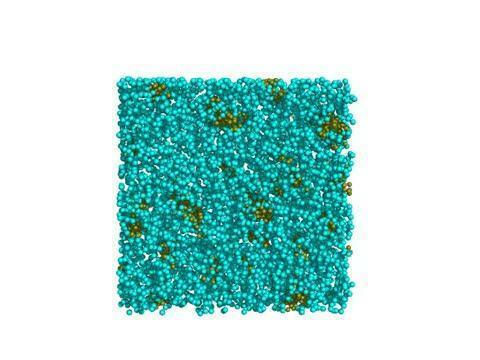 In others, they added a bacterial protein that structurally supports Rubisco. Both lines of tobacco were able to use the bacterial Rubisco for photosynthesis, and both converted CO2 to sugar faster than normal tobacco. The work provides an important foundation for testing the hypothesis that a faster Rubisco can yield a more productive plant, says Donald Ort, a plant biologist at the University of Illinois at Urbana–Champaign. But Hanson is quick to note that her team will need to do more before that hypothesis has been proven. Although the bacterial Rubisco works faster than the tobacco enzyme, it is also more prone to wasting energy by reacting with oxygen rather than CO2. Photosynthetic bacteria overcome this problem by creating specialized structures called carboxysomes, which enclose the enzyme and create a CO2-rich environment, discouraging wasteful reactions. Without carboxysomes, Hanson’s engineered plants — which also express much less Rubisco than normal plants — must be grown in chambers that can maintain artificially high CO2 concentrations. There is hope, however, that they may soon be weaned off this requirement. In June, Hanson’s team reported the creation of tobacco that could generate structures resembling bacterial carboxysomes. The next step, says Hanson, will be to try this experiment in plants that express the turbocharged bacterial Rubisco. Ort says that it may be possible to generate tobacco plants with functional carboxysomes in the next five years. Leveraging SCHOTT’s core strength in glass innovation, the partners investigated the effect of the tubing system and materials on the performance of the PBR. While many PBRs rely on plastic tubes to grow algae, these systems are plagued with plastic degradation, which disrupts light paths and hinders photosynthesis. 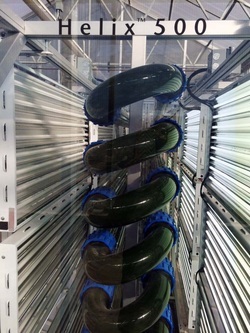 Glass tubes, while more expensive, are easy to clean, durable, and resistant to bio-fouling, and therefore deliver a high-quality product (* O-rings in the coupling may harbor bacterial biofilm contaminations that can only be rid of by steam cleaning. Even small scratches in PBRs can allow intractable biofilms to accumulate. Crevasses (to a microorganism) at the end of each tube, where couplings are situated, typically with o-rings or other sealant, is where contaminants gather, and when a chemical sterilant (e.g. hypochlorite) is used, the killed outer layer of biofilm forms an impenetrable crust that protects live cells underneath. Inexpensive plastic film disposable bioreactors may be more effective). 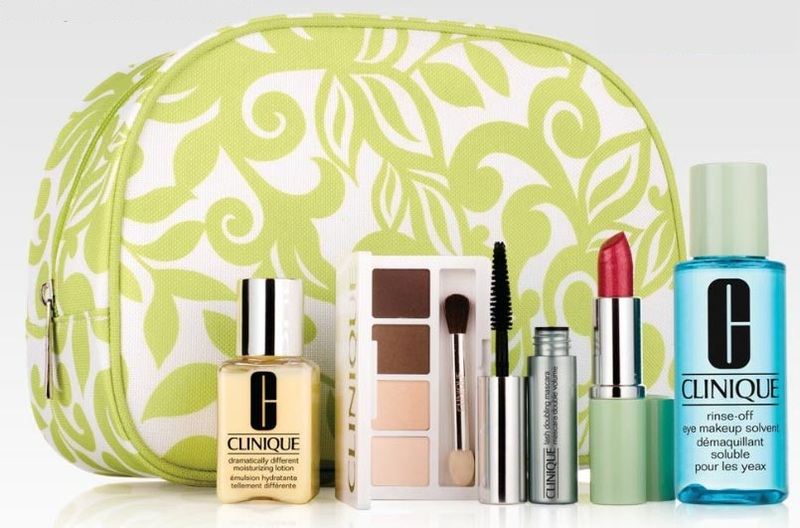 Clinique has found a unique way to help repair skin for its newest cosmetic line. Red algae, grown in the Israeli desert, is one of the main ingredients in the company’s new Custom Repair Serum. The beneficial properties of red algae was developed for commercial use by Prof. Sammy Boussiba of Ben-Gurion University of the Negev and the first red algae facility was built in the desert in the late 1990′s. Since then, Israeli scientists have continued to study the algae – which gives salmon and lobster their distinctive pinkish color – for its unusual healing properties. Dr. Amir Drory, director of Research and Development at Algatech, one of the largest algae farms in the desert, explained back in 2005 that red algae is one of nature’s top sources of astaxanthin, a carotinoid which interferes with the production and build up of cancer cells and can help build immunity. The properties of the algae also make it useful for skincare. On August 2, 2014, residents of Toledo, Ohio, woke up to a startling warning from the city: “DO NOT DRINK THE WATER.” - A few samples from the city’s water-treatment plant contained worrisome levels of a toxic chemical. 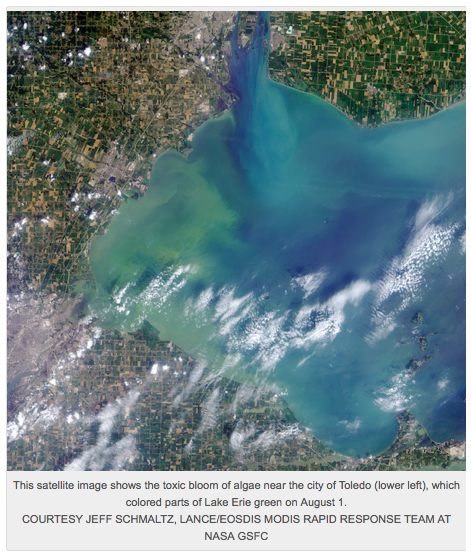 Algae in Lake Erie, where Toledo gets its water, made this toxin. Drinking water with this chemical — called microcystin — could make people sick. And boiling the water would only evaporate some of the liquid, concentrating the toxin in what was left behind. Those algae that make this toxin live in Lake Erie and many other lakes and streams. Normally, they pose no problem. But in the spring, fertilizer washes off of farms and into rivers that drain into open waters. That fertilizer contains two nutrients: nitrogen and phosphorus. Algae will gobble them up. In no time at all, their growth can skyrocket, forming what’s known as an algal bloom. And that’s what happened in Lake Erie this past summer. “It is like we’re giving all of this algae candy,” says Isabel Escobar, a professor of chemical and environmental engineering at the University of Toledo. Winds would usually keep the algal bloom away from the pipes that Toledo uses to collect drinking water from the lake, Escobar says. But this time, light winds drove the algae toward the pipes. And the bloom was so big that even the deeper water, near these pipes, was rich in algae. Once inside the water-treatment plant, the algal cells broke apart. This released their toxin into the water. This system is far from perfect, though. The law doesn’t regulate pollution that can’t be traced back to a specific point (such as a factory). Examples of such “non-point” pollution include the chemicals that wash off of city streets, lawns and farms when it rains. The fertilizer that fueled Toledo’s microcystin buildup is one example of this runoff from rains. In the online Early Edition of the Proceedings of the National Academy of Sciences. The team's research was supported by the U.S. Department of Energy. Despite its promise as a biofuel source, the USU investigators questioned whether "pond scum" could be a silver bullet-solution to challenges posed by fossil fuel dependence. 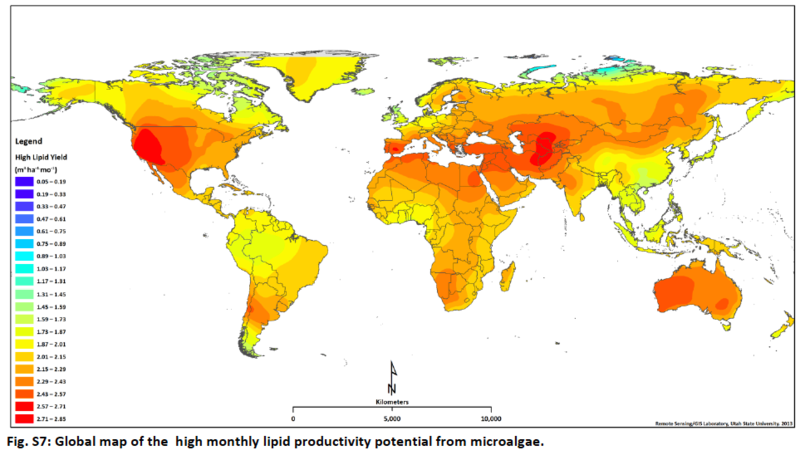 "Our aim wasn't to debunk existing literature, but to produce a more exhaustive, accurate and realistic assessment of the current global yield of microalgae biomass and lipids," Moody says. Algae, he says, yields about 2,500 gallons of biofuel per acre per year. In contrast, soybeans yield approximately 48 gallons; corn about 18 gallons. "In addition, soybeans and corn require arable land that detracts from food production," Quinn says. "Microalgae can be produced in non-arable areas unsuitable for agriculture." The researchers estimate untillable land in Brazil, Canada, China and the U.S. could be used to produce enough algal biofuel to supplement more than 30 percent of those countries' fuel consumption. "That's an impressive percentage from renewable energy," Moody says. "Our findings will help to justify the investment in technology development and infrastructure to make algal biofuel a viable fuel source." Model validation was done utilizing data from Solix generation 3 photobioreactors. A schematic of the overall geometry is presented in Fig. S2 above. 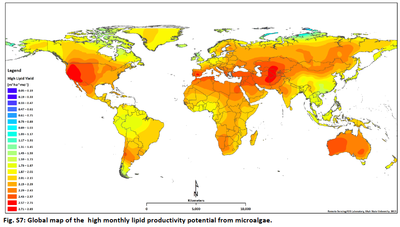 The high, average, and low monthly lipid productivity maps are presented in Fig. S7, Fig. S8, and Fig. S9, respectively. 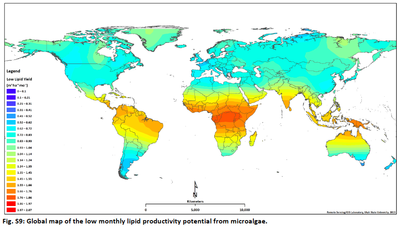 The lipid scale for these maps ranges from 0 to 3.0 m3/ha.month so a direct comparison can be made between the three maps. These maps do not include temporal resolution. 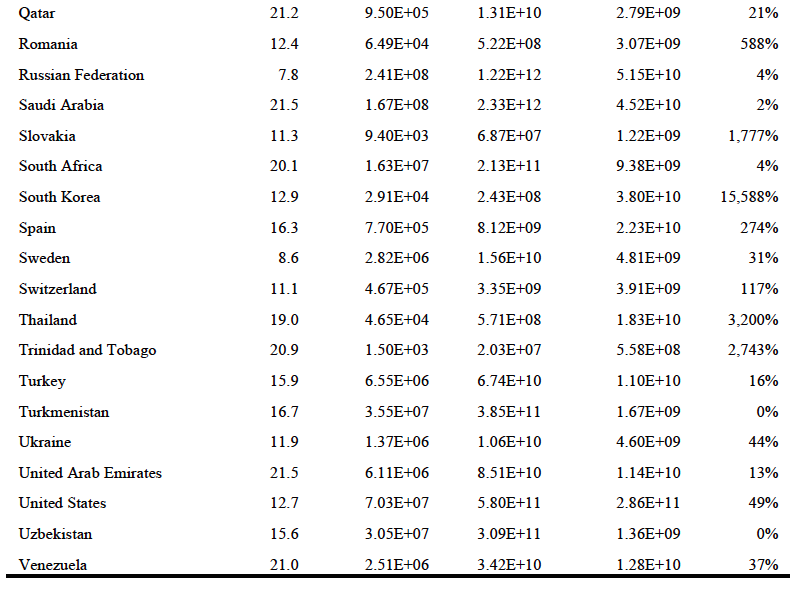 In the northern hemisphere maximum lipid yields will be attained from May to July while in the southern hemisphere minimum lipid yields will be achieved during these months. As ABLC opens, industry association executives rally the troops to fight the EPA’s slashed advanced biofuels targets, get pathway approvals faster, and to buzz about chemicals, chemicals, chemicals. http://www.biofuelsdigest.com/bdigest/2014/04/22/ablc-buzzes-about-biofuels-policy-administration-support-chemicals-and-lignin/ Also, the industry buzzed about a weird study on cellulosic biofuels emissions, and how much Administration bashing is a good idea. Advanced Ethanol Council executive director Brooke Coleman, BIO industrial & environmental section chief Brent Erickson, Advanced Biofuels Association president Mike McAdams, National Biodiesel Board policy head Anne Steckel and Re:chem Alliance chief advocate Corinne Young were the panelists in the opening session of ABLC, the annual bioeconomy leadership conference which continues through Wednesday with more than 100 speakers on the agenda on topics ranging from policy to finance and new technologies. Meanwhile, the NBB’s Steckel charted the rising production of biodiesel and renewable diesel since the RFS2 was established, noting that industry had met every production challenge and produced 1.8 billion wet gallons last year — including 266 million gallons of “drop-in”, infrastructure compatible renewable diesel — that reduced emissions by more than 50 percent compared to fossil fuels. In counting biodiesel and renewable diesel gallonage under the Renewable Fuel Standard, regulators credit 1.5 ethanol-equivalent gallons for every gallon of biodiesel and 1.7 ethanol-equivalent gallons for every gallon of renewable diesel, because those fuels have higher energy densities compared to ethanol. Coleman explained that “last year, the White House saw something that it didn’t like, which was rising RIN* prices, and they feared that it would lead to higher gas prices,” and said that the slashed EPA targets were the result of panic in the executive branch of the government. But he said that the RFS (renewable fuel standard) was working as Congress intended, and that when RIN prices rise, they encourage production. *(RIN or the Renewable Identification Number is a serial number assigned to a batch of biofuel for the purpose of tracking its production, use, and trading as required by the United States Environmental Protection Agency's Renewable Fuel Standard implemented according to the Energy Policy Act of 2005. Under the Energy Policy Act of 2005, the EPA is authorized to set annual quotas dictating what percentage of the total amount of motor fuels consumed in the US must be represented by biofuel blended into fossil fuels. Companies that refine, import or blend fossil fuels are obligated to meet certain individual RFS quotas based on the volume of fuel they introduce into the market. By fulfilling these requirements, the EPA projects that the industry will collectively satisfy the overall national quota they set. To ensure compliance, obligated parties are periodically required to demonstrate they have met their RFS quota by submitting a certain amount of RINs to the EPA. Because each of these RINs represent an amount of biofuel that has been blended into fossil fuels, the RINs submitted to the EPA by obligated parties are a quantitative representation of the amount of biofuel that has been blended into the fossil fuels used in America. The study’s lead author, University of Nebraska assistant professor of biological systems engineering Adam Liska, conceded that, in developing the scenario, he had not accounted for renewable power generation in his calculations. 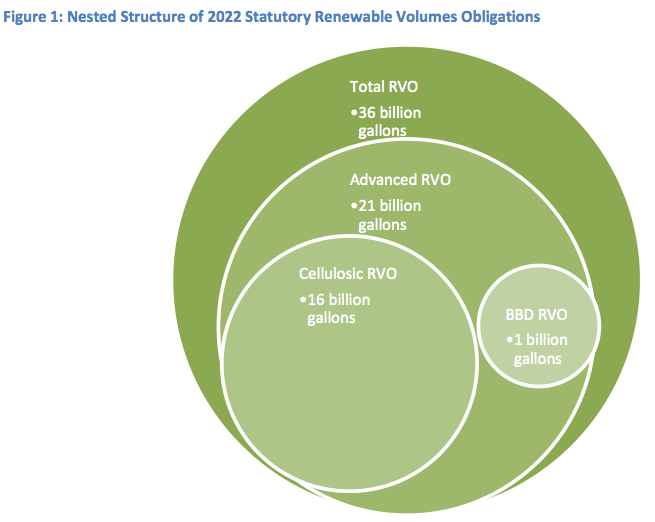 Up to 40 percent of cellulosic biomass is diverted to power generation in typical biofuels production technologies. In fact, cellulosic biofuels companies like INEOS Bio and Abengoa typically commence renewable power generation first, as their technologies are commissioned, several months before starting ethanol production. ﻿﻿February 5th, 2014: Why the Promise of Cheap Fuel from Super Bugs Fell Short The sell-off of synthetic biology pioneer LS9 goes to show that making biofuels from genetically engineered microbes has yet to deliver economically. ﻿ By Martin LaMonica on February 5, 2014, Why It Matters: No biofuels can yet compete on both price and volume with fossil fuels. 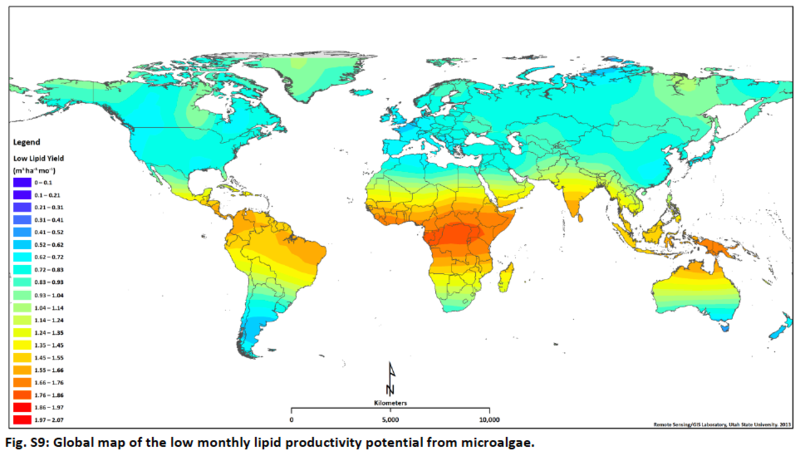 Biotech company LS9 launched in 2005 with great ambitions: founded by premier scientists and top-flight venture capitalists, it planned to genetically engineer microorganisms to make hydrocarbon fuels such as diesel cost-effectively from sugar. But after nine years and $81 million in investment, the owners of LS9 sold the San Francisco-based company last month to biodiesel maker Renewable Energy Group for $40 million in cash and stock, with an additional $21.5 million promised if technology and production milestones are met. LS9 had hoped to be selling diesel to refineries at least two years ago (see “Making Gasoline from Bacteria”). Instead, Renewable Energy Group, based in Ames, Iowa, intends to use the LS9 process to make smaller-volume specialty chemicals sometime in the next two years, and it has no immediate plans to make biofuel with the LS9 technology. LS9 is one of several companies founded on the premise that synthetic biology—advanced genetic engineering that radically changes the way an organism functions—could be used to make new strains of bacteria and yeast that would produce not just the common biofuels ethanol and biodiesel but also hydrocarbon fuels that are nearly identical to gasoline, diesel, and jet fuel. Such fuels could be used more widely than existing biofuels, which typically need to be blended with conventional fuels or require special infrastructure. But synthetic-biology companies have struggled to develop organisms that can make fuels at costs that can compete with oil, and they’ve yet to produce fuel at a large scale. Like LS9, many companies that set off to tap the gigantic markets for biofuels have pivoted toward chemicals, which command higher prices. (Breaking into these markets isn’t likely to be easy, however—they often require very high quality products, and new entrants face stiff competition from large petrochemical companies.). LS9 has a demonstration facility in Okeechobee, Florida, that successfully produced diesel at low volumes, and it signed partnerships with larger corporations for testing. But it struggled to get the financing to build a large-scale facility, says David Berry, a cofounder of LS9 and investor at Flagship Ventures. Solazyme, which uses genetically engineered algae to make products from sugar, has a program to develop fuels for the U.S. military, but much of its commercial activity is making oils for personal care and nutritional products. Amyris, which makes an oil called farnesene that can be converted into diesel, sells small amounts of fuel for buses but has focused its business on making products such as moisturizers and fragrances. Keasling says new techniques are needed to speed up the process of engineering fuel-producing organisms. If engineers could isolate desired genetic traits quickly and predict how a combination of metabolic pathway changes would affect a microorganism, then designing cells would be much faster, he says. “We need to be as good at engineering biology as we are at engineering microelectronics,” he says. Optimizing crops for energy production and new techniques for making cheaper sugars could also help bring down the cost. After cofounding LS9, Berry cofounded another biotech company called Joule that seeks to decouple fuel production from the price of sugar. It has engineered strains of photosynthetic microorganisms to produce fuels using sunlight, carbon dioxide, and nutrients, rather than from sugar (see “Audi Backs a Biofuel Startup” and “Demo Plant Targets Ultra-High Ethanol Production”). Goldman Sachs Clean Energy Ecosystem Summit - September, 2013: focused on innovation in the global energy sector, and opportunities and challenges shaping its future. The 2013 summit, held September 17-18 in Menlo Park, California, brought together leaders in the clean energy field: startups; global energy, technology and industrial companies; investors; NGOs; universities; environmental organizations; and federal, state and local officials. White paper link. Algae Competition awarded 7 prize winners from 40 finalists and 140 entries from 40 countries - May 1st 2012: The entries represent a glimpse into our future, harnessing the promise of algae, 30 times more productive than terrestrial plants. Here are some emerging themes in algae landscape and architecture design, novel algae production systems and delicious new foods from algae: http://www.algaecompetition.com/algae-slideshows/algae-awards/. Algal biofuel: In bloom or dead in the water? ﻿Tom Ireland reports from the Society's recent debate on whether fuel made from algae could ever replace oil - The Biologist Vol 61(1) p20-24.References 1. Lundquist, T. J. et al. A Realistic Technology and Engineering Assessment of Algae Biofuel Production. Energy Biosciences Institute (2010). http://works.bepress.com/tlundqui/5, 2. Shirvani, T. et al. Life cycle energy and greenhouse gas analysis for algae-derived biodiesel. Energy Environ. Sci. 4, 3773-3778 (2011). One Barrel for Baja (1BFB), July 11, 2011: is a project made possible by the San Diego Center for Algal Biotechnology (SD-CAB) in support of research aimed towards understanding and developing eco-friendly energy solutions. The goal of 1BFB is to obtain enough biomass to fill one 42-gallon barrel with algal biofuel (also known as B100 biodiesel). The barrel will be used in the Baja 1000, a series of off-road desert races that will take place on November 17, 2011 in the Baja California Peninsula.